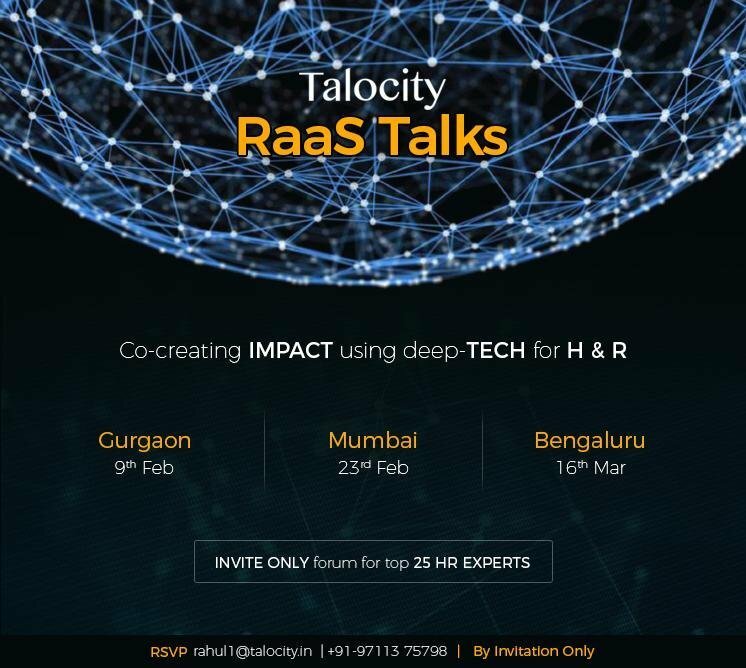 Talocity RaaS Talks, is a CXO’s round table, that focusses on conversations around RaaS: Relationship as a Service where-in Human focusses on relationships & machine manages the rest. The Talks bring together some forward looking discussions around future technology trends, disruption in industry’s best practices in the areas of Talent Hiring and Talent Management & successful case studies of implementation across growth companies. The latest edition of the RaaS Talks took place in Bangalore, Hotel Shangri-La and was graced by some of the top CEOs, CHROs, TA Heads and CTOs; who engaged and brought out ways to drive change and adopt new TECH within hiring & talent management. Currently, Talocity RaaS Talks happens over breakfast across major cities in India. This is a focused group meet-up (invitation only) of CHROs, TA Heads & CTOs to discuss the current and future technology trends, disruptions and industry best practices sharing, in the space of Talent Hiring and Talent Management. We also envisage partnering with many research studies and presenting expert views going forward. Post the Talks, Ketan Dewan, founder and CEO, Talocity said, In the digital & connected world, the power of relationships is the key & the core to all our people related strategies and agendas. I know him very well | He did so much for me that I am... | I am indebted to her for the support…| He got me my first job & many more thoughts that we all experience in our lives around people and relationships. Isn’t it !. While we all have access to each other and our employees & prospective employees; yet there is a need for connect beyond an electronic connect. And no machine can provide that connect. It can at best provide the access. Having said that, we spend so much of time evaluating the access points that we are left with no time to create the connect. The time for human love for transactional work has to go away. If humans manage relationships then machines can do the rest. The What we need to do has to be very clear- our people strategy and what we want to achieve as an outcome of it, in the near term and the mid-term, is core to Talent management & recruitment. The How can be solved using TECH & there are some very interesting niche technologies providing point solutions available in the market. The Talks revolved around the change management around The What & The How and the leaders who graced the occasion include: Raj Narayan: CHRO, Titan Industries Limited; Karthik SM: Director Talent Acquisition, IQVIA; Balachandar N: Group Director- HR, Coffee Day Group; Sudhir Mattoo: Director- Talent, IBM; Sumathi Sampath, Head Talent, Infosys BPO, Amreeta Mazumdar: Head of India Tech Staffing, Google; Paneesh Rao: CHRO L&T Technology Services Limited; Somnath Bhagavatula: HR Director- Atkins; Hirendra Badhiye: VP- HR, Northern Trust; Uday Shetty: Head HR, Stanley Lifestyles; Rajnesh Khosla: Head HR, LG, Om Sahay: Associate Director- HR, Neilsen; Ashok G: Chief Working Officer, Nexleap; Prithvi Shergill: Founder, Tomorrow; Srinivas Yelandur, Venture Advisor and many more friends from HR & media. On one side the business is burning & on the other side good TECH in Recruitment & Talent management is waiting to be deployed; but still companies take a long time to decide. Lets wish good morning to RaaS. Talocity had representation from its core team members including: Debi Prasad Das: Growth Founder & Chief Mentor & Ketan Dewan, Co-founder & CEO.